We are in the School of Chemical, Biological, and Environmental Engineering at Oregon State University. The Fu lab research program encompasses microfluidics-based sensor technology development with the aims of understanding the physics and chemistry of device operation and improving device performance for field applications. September 2018 - NIH funds our smart wound monitor collaboration with PI Dr. Johnston in EECS! August 2018 - Elain gives an invited talk at the American Chemical Society! July 2018 - Corey's article is published in Analytical Methods! June 2018 - Rachel and Kian are 2018 Johnson Interns! June 2018 - David completes his Honors Thesis! May 2018 - Elain gives an invited talk at the 101st Canadian Chemistry Conference! February 2018 - ARF provides seed funds to develop an As sensor with Dr. Chang's lab! December 2017 - Elain gives an invited talk at the 2017 Microfluidics Congress in London! September 2017 - Lael joins the lab! August 2017 - NIH funds continued development of our Phe monitor! June 2017 - We start work on an NIH-funded project to develop a HIV test for infant diagnosis with PI Dr. Lutz at UW! May 2017 - Jessy's article is published in Analytical Methods! Mar. 2017 - Madeleine joins the lab! Mar. 2017 - Mike Rodriguez joins the lab! Mar. 2017 - Anthony's and Corey's article is published in the Journal of Microelectronics and Microengineering! Jan. 2017 - Elain's and Corey's invited critical review is published in Lab on a Chip! Nov. 2016 - Elain gives a plenary talk at AES at AIChE. Oct. 2016 - Jensen joins the lab as a Sophomore Women's Research Fellow. Jun. 2016 - Caitlin and Ian join the lab! Jun. 10, 2016 - Wyatt, Dylan, and Robert graduate from OSU CBEE! Jun. 3, 2016 - Robert successfully completes his M.S. examination! May 23, 2016 - Dylan successfully completes his Bioenergy presentation and defense! May 2016 - Gary joins the lab! Mar. 15, 2016 - Elain gives an invited talk at the SELECTBIO Point-of-care Diagnostics Conference in Madrid. Feb. 15, 2016 - Our manuscript on a whole blood Phe test is published in Micromachines! Feb. 2, 2016 - Our manuscript on the malaria assay system is published in Analytical Chemistry! Nov. 15, 2015 - Elain gives an invited talk at IEEE Nanomed. Nov. 10, 2015 - Robert gives a talk at AIChE! Oct. 19, 2015 - Elain gives a talk at AVS. Oct. 10, 2015 - Jessy presents a poster at BMES! Oct. 9, 2015 - Elain gives a talk at BMES. Sept. 15, 2015 - Carly's manuscript on immobilizing affinity proteins is published in Analytical and Bioanalytical Chemistry! Aug. 31, 2015 - Corey joins the lab. June 2015 - David, Anthony, and Devin join the lab. June 12, 2015 - Jeff graduates from UW BioE! May 15, 2015 - Dylan receives a Bioenergy Scholarship! April 13, 2015 - Elain will be starting a tenure-track position in CBEE this fall and is excited to begin teaching! Jan. 15, 2015 - Bhushan's article on a valving toolkit is accepted at Lab on a Chip! Dec. 12, 2014 - NPKUA is providing funds that will support further development of our home phenylalanine monitoring device! Nov. 17, 2014 - Liam and Wyatt present posters at AIChE! 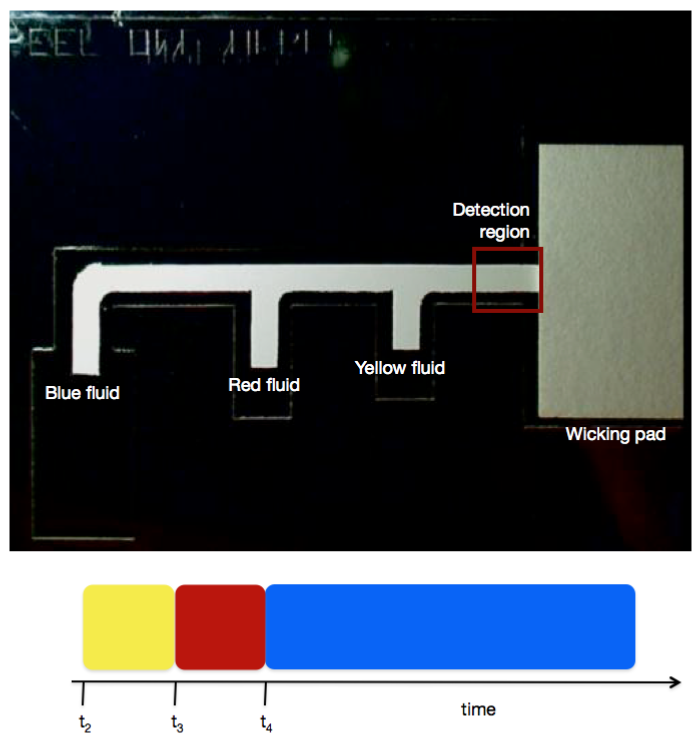 Nov. 11, 2014 - Our manuscript on phenylalanine detection in a paper-based device is accepted for publication at Analyst! Oct. 25, 2014 - Elain gives a talk at BMES and co-chairs a session on Global Health Technologies. Oct. 23, 2014 - Tinny presents a poster at BMES. Oct. 16, 2014 - Tinny successfully completes her M.S. examination! August 14, 2014 - Greg successfully completes his M.S. examination! July 5, 2014 - Elain's article on equipment-free readout in paper-based devices is accepted to Analyst. June 13, 2014 - Kim and Jared graduate from UW BioE! Apr. 1, 2014 - Jared is awarded an NSF fellowship. Congratulations Jared! Mar. 31, 2014 - Liam, Wyatt, and Robert join the lab! Feb. 5, 2014 - Sujatha's article is published in Analyst. Jan. 29, 2014 - Research collaboration with Poulsen and Hase in Veterinary Medicine has been funded by the OSU Agricultural Research Foundation! Jan. 6, 2014 - Dylan Hinson joins the lab with an URSA ENGAGE award! Nov. 2013 - Review article by Sam, Greg, and Elain is published in Bioanalysis. Nov. 7, 2013 - Our article on "Diagnostics for Global Health" is published in Project Syndicate. Oct. 31, 2013 - Jared's article is accepted for publication in Analytical Chemistry! Oct. 25, 2013 - Bhushan's article is accepted for publication in Analytical Chemistry! Oct. 18, 2013 - Jared is awarded a Washington Research Foundation Scholarship! Oct. 10, 2013 - Elain gives a presentation at the Point-of-care Diagnostics Seminar Series at Berkeley. Sept. 28, 2013 - Jared and Jeff present posters at BMES! Sept. 27, 2013 - Elain gives a talk at BMES and co-chairs a session on emerging technologies. Elain has a Ph.D. in physics from the University of Maryland and an Sc.B. in physics from Brown University. She transitioned to the field of bioengineering as a Research Scientist in the laboratory of Paul Yager at the University of Washington. Elain was a Research Assistant Professor in the Department of Bioengineering at the University of Washington from 2010 to 2013. She joined the faculty at Oregon State University in the School of Chemical, Biological, and Environmental Engineering in the autumn of 2013. She is currently an Assistant Professor in Bioengineering. Elain is also an Adjunct Assistant Professor in the Department of Biomedical Sciences at Oregon State University and an Affiliate Assistant Professor in the Department of Bioengineering at the University of Washington. Corey joined the lab as a chemical engineering Ph.D. student after obtaining a B.S. in bioengineering from OSU. He is working on developing simple low-cost electrochemical sensors for use in precision health applications. He is a co-author on three publications from our lab. Mike joined the lab as a chemical engineering Ph.D. student after obtaining a B.S. in chemistry from Trinity University. He is working to improve the sensitivty of immunoassays in paper microfluidic devices. Lael joined the lab as a bioengineering Ph.D. student after obtaining a B.S. in Bioengineering from the University of Washington. She is working on the development of a home phenylalanine monitor. Madeleine is an undergraduate in the chemical engineering program at OSU. She is completing her Honors College thesis project on the topic of phenylalanine dehydrogenase stability to freeze-thaw. Arianna is a bioengineering major at OSU. She joined the lab as a Johnson Intern in 2017, and has been developing methods of wax patterning in porous materials. Kian is a chemical engineering major at OSU. He joined the lab as a Johnson Intern in 2018, and has been developing methods of dry reagent preservation. Rachel is a bioengineering major at OSU. 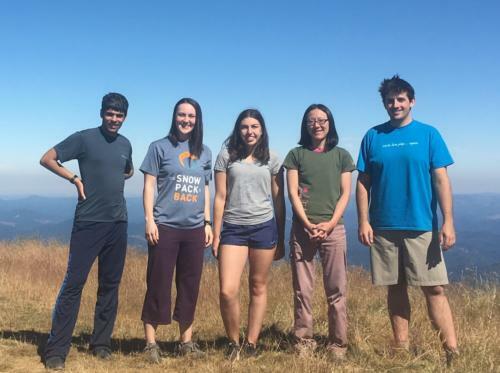 She joined the lab in 2017, and received a Johnson summer internship in 2018. She is developing a valve for paper microfluidic devices. Caitlin is an undergraduate in the bioengineering program at OSU. She joined the lab as a Johnson intern, and is completing her Honors College thesis project on the topic of improving stencil-printed electrodes in porous materials. Group hike of the East Ridge trail on Mary's Peak in the summer of 2018. From left to right, Kian, Lael, Rachel, Elain, and Corey. Madeleine, Caitlin, Arianna, and Mike are not pictured. David graduated from OSU with a B.S. degree in bioengineering. He joined the lab as a Johnson intern and worked as a 2nd year Johnson intern during the following summer. He completed his Honors College thesis on the topic of an alginate-based valve. David is in medical school at OHSU. Kim was motivated to join the lab because of its focus on developing tests that could be used to diagnose and then treat those in need in low-resource settings. For her Capstone project, Kim worked on the development of a paper-based assay for phenyalanine detection, focusing on storing reagents in dry form. Kim has the goal of joining a nonprofit organization with an emphasis on the development of point-of-care diagnostic devices. Dylan joined the lab on an URSA ENGAGE award and worked on modeling immunoassay systems. Dylan received OSU Bioenergy Scholarships in 2014 and 2015 and completed a Bioenergy thesis project on the topic of paper-based detection of phenolic compounds in 2016. He graduated from OSU BioE and is currently serving as a Peace Corp volunteer in Namibia. Jared worked on multiple projects in the lab, including the development of a novel method of metering fluids in paper-based devices, and for his Capstone project, the development of an immunoassay for small molecule detection. During his time at UW, Jared was the recipient of two Mary Gates Research Scholarships, a Bioengineering Scholarship, and a Washington Research Foundation Scholarship. He is a co-author on four publications from the lab. Jared has the goal of obtaining a Ph.D. in bioengineering and remaining in academia as a research professor. Jared is the recipient of a NSF fellowship and is currently a Ph.D. student at the University of Michigan. Jessy graduated from the bioengineering program at OSU with a B.S. degree. She joined the lab as a Johnson intern and was awarded a second year Johnson internship for the summer of 2015. She developed a cost-effective method for stamping antibodies onto nitrocellulose substrates. She presented her work at BMES in the fall of 2015 and her research was published in 2017. She is working at a biomedical product company in the Bay area. Tinny received B.S. and M.S. degrees in Bioengineering from the University of Washington. As an undergraduate, she won numerous awards including Mary Gates Research and Leadership Scholarships, a Bioengineering Scholarship, and was named a Levinson Emerging Scholar. She was also awarded an NSF Fellowship to complete her M.S. work. Tinny's research focused on the development of a high sensitivity paper-based diagnostic test for malaria. She is a co-author on six publications from the lab. After graduation, Tinny plans to become a physician researcher and contribute innovative solutions to medical problems to improve the quality of life of suffering patients all over the world. She is a medical student at the University of Washington. Brittney was motivated to join the lab from her experience of witnessing loved ones, living in her parents' home country, suffer from preventable and treatable infectious diseases. For her Capstone project in Bioengineering at the University of Washington, Brittney developed a novel method of sequencing fluids in paper-based devices. During her time in the lab, she was supported by the NASA Summer Undergraduate Research Program and a Mary Gates Research Scholarship. She is a co-author on one publication from the lab. Brittney is a Ph.D. student at the University of California, Riverside. Robert joined the lab after obtaining a B.S. in chemical engineering from OSU. He contributed to multiple projects during his time in the lab and was a co-author on three publications. He graduated with an M.S. degree in chemical engineering in 2016 and is working at Intel. Devin has a B.S. in chemical engineering from OSU. He completed a senior design project in the lab and then worked for six months with us on the topic of dry reagent preservation. Wyatt worked to develop a test for the detection of bacteria in a milk sample, a project funded by the OSU Agricultural Research Foundation. He was awarded a second year Johnson internship for the summer of 2014. He graduated from OSU with a degree in chemical engineering in 2016. Greg was drawn to this research because of its ultimate goal to reduce the worldwide burden of disease, especially in low-resource settings. Greg completed his Master's degree in my lab at the University of Washington working on the development of a field test for the detection of phenyalanine. He is a co-author on three publications from the lab. Anthony graduated from OSU with a B.S. degree in bioengineering. He completed his Honors College thesis project on wax transfer printing in porous substrates. He is a co-author on one publication from the lab. Liam graduated from OSU with a B.S. degree in chemical engineering. He was awarded a second year Johnson internship for the summer of 2014. He completed an Honors College thesis on the topic of a semi-quantitative test for PKU patients and is the co-author on a publication from our lab. Jeff was motivated to join the lab through his interest in diagnostics and desire to conduct research in an area with life-saving potential. For his Capstone project, he developed methods to control the velocity of fluids in paper-based devices to improve their efficiency. Jeff has the goal of becoming an Emergency Room physician and hopes to see these devices being used to help diagnose patients. Jeff is a medical student at Hofstra Northwell School of Medicine. The goal of the Fu Lab is to advance the engineering of novel microfluidic tools and devices for field use through improving our understanding of the devices' underlying physicochemical processes. Research in the lab consists of three areas of focus: the investigation of molecular interactions and fluid transport in microfluidic systems, the development of tools and methods for use in high-performance microfluidic assays, and the implementation of microfluidic assays for clinically relevant analytes. Global health application domains of interest include human disease diagnosis, veterinary medicine, environmental monitoring, and agriculture. In addition, a related area of interest is undergraduate curriculum development using paper microfluidics. Most recently, the lab's research focus has been on the development of “paper” networks. The lab is developing tools to manipulate multiple fluid volumes within porous materials and is using these tools to perform automated multi-step sample processing that is characteristic of "gold-standard" lab-based assays. Implementation into simple to use and inexpensive to fabricate disposable devices will enable high performance testing in even the lowest-resource settings. The image shows a simple 3 inlet paper network, which can automatically deliver a desired sequence of fluids to the detection region. In this case, the network is located on one side of a folding card device. The fluids of interest are added to source pads on the other side. The device is activated by folding the card closed, such that the fluids in the source pads contact the inlets of the network for simultaneous fluid flows into the network. The schematic shows the desired delivery of the fluid volumes, yellow, red, then blue. The fluids are staged in the main channel of the device and then delivered in the desired sequence to the detection region of the device. Click on the image for a demonstration of the sequenced delivery. The shape and dimensions of the paper network can be tailored to deliver the desired number of fluids and volumes. Microfluidic tools to manipulate multiple fluid volumes within porous networks are key to creating simple to use devices appropriate for use in low-resource settings. Many tools have been developed, with only a few highlighted here. In addition to A) network topology (see Fu et al., Analytical Chemistry, 2012), other tools have been used to demonstrate sequential delivery in paper networks, B) sugar barrier delays (see Lutz et al., Lab on a Chip, 2013), C) geometry (see Fu et al., Microfluidics and Nanofluidics, 2011), and D) absorbent pad delays (see Toley et al., Analytical Chemistry, 2013). A high sensitivity assay for the detection of a malaria antigen has been developed using the simple paper network design described above. The assay performs the automated delivery of sample plus label, a rinse to remove nonspecifically bound species that contribute to the system as noise, and a set of amplification reagents to amplifiy the signal produced by the original label. The fully-disposable assay card is shown in the image on the left, while images of the folded card (top) and a concentration series of the detection region of the assay (bottom) are shown on the right. By enabling additional sample processing steps, the amplified assay was shown to improve the limit of detection significantly to levels comparable to lab-based testing with ELISA (see Fu et al., Analytical Chemistry, 2012). 1. C. Downs, A. Nejely, and E. Fu, Disposable fabric-based electrochemical sensors fabricated from wax-transfer-printed fluidic cells and stencil-printed electrodes, Analytical Methods 10, 3696-3703 (2018). 2. C. Anderson, C. Holstein, E. Strauch, S. Bennett, A. Chevalier, J. Nelson, E. Fu, D. Baker, and P. Yager, Rapid Diagnostic Assay for Intact Influenza Virus Using a High Affinity Hemagglutinin Binding Protein, Analytical Chemistry 89, 6608-6615 (2017). 3. J. Imdieke and E. Fu, Porous stamp-based reagent patterning for lateral flow assays, accepted to Analytical Methods 9, 2751-2756 (2017). 4. S. Huang, K. Abe, S. Bennett, T. Liang, P. Ladd, L. Yokobe, C. Anderson, K. Shah, J. Bishop, M. Purfield, P. Kauffman, S. Paul, A. Welch, B. Strelitz, K. Follmer, K. Pullar, L. Sanchez-Erebia, E. Gerth-Guyette, G. Domingo, E. Klein, J. Englund, E. Fu, and P. Yager, Disposable Autonomous Device for Rapid Swab-to-Result Diagnosis of Influenza, Analytical Chemistry 89, 5776-5783 (2017). 5. A. To, C. Downs, and E. Fu, Wax transfer printing to enable robust boundary definition in devices based on non-standard porous materials, Journal of Micromechanics and Microengineering 27, 057001 (6pp) (2017). 6. E. Fu and C. Downs, Progress in the development and integration of fluid flow control tools in paper microfluidics, Lab on a Chip 17, 614-628 (2017). 7. T. Liang, R. Robinson, J. Houghtaling, G. Fridley, S. A. Ramsey, and E. Fu, Investigation of Reagent Delivery Formats in a Multivalent Malaria Sandwich Immunoassay and Implications for Assay Performance, Analytical Chemistry 88, 2311-2323 (2016). 8. R. Robinson, L. Wong, R. J. Monnat Jr., and E. Fu, Development of a Whole Blood Paper-Based Device for Phenylalanine Detection in the Context of PKU Therapy Monitoring, Micromachines 7, 28-37 (2016). 9. C.A. Holstein, A. Chevalier, S. Bennett, C.E. Anderson, K. Keniston, C. Olsen, B. Li, B. Bales, D.R. Moore, E. Fu, D. Baker, and P. Yager, Immobilizing Affinity Proteins to Nitrocellulose: A Toolbox for Paper-Based Assay Developers, Analytical and Bioanalytical Chemistry 408, 1335-1346 (2015). 10. 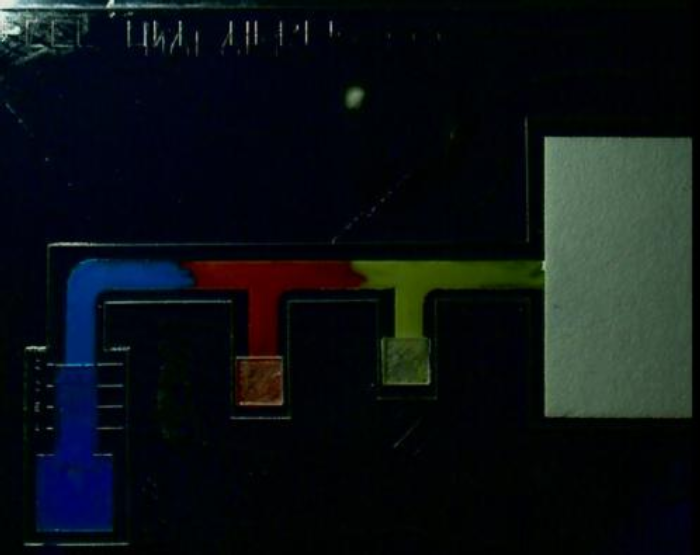 B. Toley, J. Wang, M. Gupta, J. Buser, L. Lafleur, B. Lutz, E. Fu, and P. Yager, A versatile valving toolkit for automating fluidic operations in paper microfluidic devices, Lab on a Chip 15, 1432-1444 (2015). 11. G. Thiessen, R. Robinson, K. De Los Reyes, R. Monnat, and E. Fu, Conversion of a laboratory-based test for phenylalanine detection to a simple paper-based format and implications for PKU screening in low resource settings, Analyst 140, 609-615 (2015). 12. E. Fu, Enabling robust quantitative readout in an equipment-free model of device development, Analyst 139, 4750-4757 (2014). 13. S. Ramachandran, E. Fu, B. Lutz, and P. Yager, Long-term dry storage of an enzyme-based reagent system for ELISA in point-of-care devices, Analyst 139, 1456-1462 (2014). 14. B. Toley, B. McKenzie, T. Liang, J. Buser, P. Yager, and E. Fu, Tunable-delay shunts for paper microfluidic devices, Analytical Chemistry 85, 11545-11552 (2013). 15. J. Houghtaling, T. Liang, G. Thiessen, and E. Fu, Dissolvable bridges for manipulating fluid volumes in paper networks, Analytical Chemistry 85, 11201-11204 (2013). 16. S. Byrnes, G. Thiessen, and E. Fu, Progress in the development of paper-based diagnostics for low-resource point-of-care settings, Bioanalysis 5, 2821-2836 (2013). 17. P. Spicar-Mihalic, B. Toley, J. Houghtaling, T. Liang, P. Yager, and E. Fu, CO2 laser cutting and ablative etching for the fabrication of paper-based devices, Journal of Micromachining and Microengineering 23, 067003 (2013). 18. B. Lutz, T. Liang, E. Fu, S. Ramachandran, P. Kaffman, and P. Yager, Dissolvable fluidic time delays for programming multi-step assays in instrument-free paper diagnostics, Lab on a Chip 13, 2840-2847 (2013). 19. G. Fridley, H. Le, E. Fu, and P. Yager, Controlled release of dry reagents in porous media for tunable temporal and spatial distribution upon rehydration, Lab on a Chip 12, 4321-4327 (2012). 20. E. Fu, T. Liang, P. Spicar-Mihalic, J. Houghtaling, S. Ramachandran, and P. Yager, A two-dimensional paper network format that enables simple multi-step assays for use in low-resource settings in the context of malaria antigen detection, Analytical Chemistry 84, 4574-4579 (2012). 21. E. Fu, T. Liang, J. Houghtaling, S. Ramachandran, S. Ramsey, B. Lutz, and P. Yager, Enhanced sensitivity of lateral flow tests using at two-dimensional paper network format, Analytical Chemistry 83, 7941-7946 (2011). 22. B. Lutz, P. Trinh, C. Ball, E. Fu, and P. Yager, Two-dimensional paper networks: programmable fluidic disconnects for multi-step processes in shaped paper. Lab on a Chip 11, 4274-4278 (2011). 23. E. Fu, S. A. Ramsey, P. Kauffman, B. Lutz, and P. Yager, Transport in two-dimensional paper networks, Microfluidics and Nanofluidics 10, 29-35 (2011). 24. J. Osborn, B. Lutz, E. Fu, P. Kauffman, D. Stevens, and P. Yager, Microfluidics without pumps: translating adjacent flows onto paper networks, Lab on a Chip 10, 2659-2665 (2010). 25. P. Kauffman, E. Fu, B. Lutz, and P. Yager, Visualization and measurement of flow in two-dimensional paper networks, Lab on a Chip 10, 2614-2617 (2010). 26. E. Fu, P. Kauffman, B. Lutz, and P. Yager, Chemical signal amplification in two-dimensional paper networks, Sensors and Actuators B 149, 325-328 (2010). 27. E. Fu, B. Lutz, P. Kauffman, P. Yager, Controlled reagent transport in disposable 2D paper networks, Lab on a Chip 10, 918-920 (2010). 28. E. Fu, K. E. Nelson, S. A. Ramsey, J. O. Foley, K. Helton, P. Yager, Modeling of a competitive microfluidic heterogeneous immunoassay: sensitivity of the assay response to varying system parameters, Analytical Chemistry 81, 3407-3413 (2009). 29. K. Helton, K. Nelson, E. Fu, and P. Yager, Conditioning saliva for use in a microfluidic sensor, Lab on a Chip 8, 1847-1851 (2008). 30. M. Hasenbank, T. Edwards, E. Fu, R. Garzon, T. Kosar, M. Look, A. Mashadi-Hossein, and P. Yager, Demonstration of multi-analyte patterning using piezoelectric inkjet printing of multiple layers, Analytica Chimica Acta 611, 80-88 (2008). 31. J. Foley, A. Mashadi-Hossein, E. Fu, B. Finlayson, and P. Yager, Experimental and model investigation of the time-dependent 2-dimensional distribution of binding in a herringbone microchannel, Lab on a Chip 8, 557-564 (2008). 32. J. Foley, E. Fu, L. Gamble, and P. Yager, Microcontact printed antibodies on gold surfaces: Function, uniformity, and silicone contamination, Langmuir 24, 3628-3635 (2008). 33. E. Fu, S. A. Ramsey, P. Yager, Dependence of the signal amplification potential of colloidal gold nanoparticles on resonance wavelength in surface plasmon resonance-based detection, Analytica Chimica Acta 599, 118-123 (2007). 34. M. Hasenbank, E. Fu, J. Nelson, D. Schwartz, and P. Yager, Investigation of heterogeneous electrochemical processes using multi-stream laminar flow in a microchannel, Lab on a Chip 7, 441-447 (2007). 35. K. Hawkins, M. Steedman, R. Baldwin, E. Fu, S. Ghosal, and P. Yager, A method for characterizing adsorption of flowing solutes to microfluidic surfaces, Lab on a Chip 7, 281-285 (2007). 36. 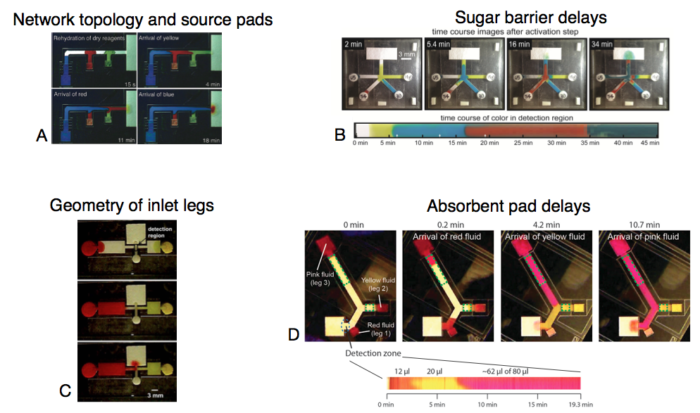 T. Chinowsky, M. Grow, K. Johnston, K. Nelson, T. Edwards, E. Fu, and P. Yager, Compact surface plasmon resonance imaging system for saliva-based medical diagnostics, Biosensors and Bioelectronics 22, 2208-2215 (2007). 37. E. Fu, S. Ramsey, J. Chen, T. Chinowsky, B. Wiley, Y. Xia, and P. Yager, Resonance wavelength-dependent signal of absorptive particles in surface plasmon resonance-based detection, Sensors and Actuators B 123, 606-613 (2007). 38. M. Hasenbank, E. Fu, and P. Yager, Lateral spread of an amplification signal using an enzymatic system on a conductive surface, Langmuir 22, 7451-7453 (2006). 39. E. Fu, S. Ramsey, R. Thariani, and P. Yager, One-dimensional surface plasmon resonance imaging system using wavelength interrogation, Review of Scientific Instruments 77, 076106 (2006). 40. P. Yager, T. Edwards, E. Fu, K. Helton, K. Nelson, M. Tam, and B. Weigl, Microfluidic diagnostic technologies for global public health, Nature 442, 412-418 (2006). Cited by 736. 41. M. S. Munson, M. S. Hasenbank, E. Fu, and P. Yager, Suppression of non-specific adsorption using sheath flow, Lab on a Chip 4, 438-445 (2004). 42. E. Fu, T. Chinowsky, J. Foley, J. Weinstein, and P. Yager, Characterization of a wavelength-tunable surface plasmon resonance microscope, Review of Scientific Instruments 75, 2300-2304 (2004). 43. E. Fu, J. Foley, and P. Yager, Wavelength-tunable surface plasmon resonance microscope, Review of Scientific Instruments 74, 3182-3184 (2003). 44. E. S. Fu, X. S. Wang, and E. D. Williams, Characterization of structures fabricated by atomic force microscope lithography, Surface Science 438, 58-67 (1999). 45. C. J. Lanczycki, R. Kotlyar, E. Fu, Y.-N. Yang, E. D. Williams, and S. Das Sarma, Growth of Si on the Si(111) surface, Physical Review B 57, 13132-13148 (1998). 46. E. S. Fu, D.-J. Liu, M. D. Johnson, J. D. Weeks, and E. D. Williams, The effective charge in surface electromigration, Surface Science 385, 259-269 (1997). 47. D.-J. Liu, E. S. Fu, M. D. Johnson, J. D. Weeks, and E. D. Williams, Relaxation of the step profile for different microscopic mechanisms, Journal of Vacuum Science and Technology B 14, 2799-2808 (1996). 48. E. S. Fu, M. D. Johnson, D.-J. Liu, J. D. Weeks, and E. D. Williams, Size-scaling in the decay of metastable structures, Physical Review Letters 77, 1091-1094 (1996). 49. Y.-N. Yang, E. S. Fu, and E. D. Williams, An STM study of current-induced step bunching on Si(111), Surface Science 356, 101-111 (1996). 50. E. D. Williams, E. Fu, Y.-N. Yang, D. Kandel, and J. D. Weeks, Measurement of the anisotropy ratio during current-induced step bunching, Surface Science 336, L746-L752 (1995).